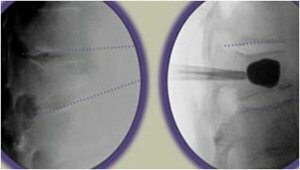 Kyphoplasty involves a minimally invasive approach to inject cement into	a vertebral body compression fracture. Under x-ray guidance with a small	incision, the cement is injected into a nonhealing and painful fracture. The cement provides stability to the fractured bone which can allow people	to mobilize with less pain. Figure 1. Lateral x-rays show the compression fracture on the left, with	restoration of height of the vertebral body with injection of the cement	on the right.